Augmented Reality Youtube Channels List. The Best Augmented Reality Youtube Channels from thousands of top Augmented Reality Youtube Channels in our index using search and social metrics. Data will be refreshed once a week. About Youtuber AWE (Augmented World Expo) is the world’s largest AR & VR conference and expo. AWE gathers the top innovators – from the hottest startups to Fortune 500 – to showcase the best augmented world experiences in all aspects of life and work. About Youtuber Re public, republic-lab a creative inc have designed a platform that augment any art design into augmented reality experience. With the help of artists and designers around the globe we have made street design into augmented reality experience. About Youtuber My name is Matthew Hallberg I make tutorials for Apple ARkit Virtual Reality and Augmented Reality using the Unity 3D video game engine. About Youtuber This is Augmented Reality channel that demonstrates how to make various Augmented Reality applications in just a few minutes. This is not only for developers, but for all people that wants to play around with Augmented Reality and get more familiar with this technology. About Youtuber Blippar is the leading visual discovery app using augmented reality and artificial intelligence technology. About Youtuber Wikitude is the leading cross-platform augmented reality SDK for phones, tablets, and smart glasses with over 100,000 registered developers, 25,000 published apps, and 1 billion app installs. Wikitude enables developers, agencies, and enterprises to create AR experiences that delight, amaze, and provide tangible return on investment. About Youtuber DAQRI is the world’s leading augmented reality (AR) technology company. The cutting-edge DAQRI Visual Operating System™ (Vos) powers an ecosystem of products, including DAQRI Smart Helmet®, DAQRI Smart Glasses™, and DAQRI Smart HUD™. About Youtuber Quickly create and deploy engaging IoT applications and AR experiences – without writing any code! With PTC’s ThingWorx, you can take your business to a new level today. About Youtuber This is VR & AR Technology Video channel. zed interactive create Unity 3D video, virtual reality apps, Augmented reality app, 3D interactive application development, 3d rendering company. About Youtuber India's first general purpose Augmented Reality Mobile Application. Augmenting your imaginations with realities. The future is here! About Youtuber SketchAR is an application through which the user sees a virtual image on the surface of which they are planning to trace a sketch. In one hand, the user holds a phone and sees a virtual image, while the other hand traces virtual lines already on the paper. About Youtuber Welcome to mixed reality TV! On this channel you will find news, reviews and tutorials about Virtual and Augmented Reality platforms with a focus on Windows Mixed Reality. About Youtuber When we're not here talking about mixed reality and the future of computing, we're busy putting robots in your kitchen and making music you can touch. About Youtuber Since 2012, Meta has strived to make augmented reality (AR) not only the next computing platform, but also the most intuitive and collaborative computing experience. We began the advancement of the AR marketplace with the Meta 1, the first see-through headset launched in 2014, that enabled users to use natural hand interactions to intuitively move and manipulate holographic content. About Youtuber Augment is the leading enterprise augmented reality platform. Augment's off-the-shelf mobile solution allows you to bring your products to life in real time #AR. About Youtuber Since its inception in 1999, Total Immersion has lead the industry in AR technology with over 2,000 executed augmented reality applications for name brands and organizations. Total Immersion is the global leader in Augmented Reality and Virtual Try-on solutions for eyewear, furniture, and accessories. About Youtuber EON Reality is the world leader in Virtual Reality (VR) and Augmented Reality (AR) based knowledge transfer for industry and education. About Youtuber ARmedia - Augmented Reality Media is a brand by Inglobe Technologies, one of the leading AR companies worldwide. We create Augmented and Virtual Reality experiences and platforms for the end-users and the enterprise. About Youtuber The Quiver App combines physical coloring from “back in the day” with state of the art augmented reality technology to bring you and your children an extraordinarily magical experience. About Youtuber Marxent is the leader in Augmented Reality, Virtual Reality and 3D solutions for furniture and home goods retailers. Marxent’s 3D Furniture Cloud™ platform leverages 3D visualization in combination with easy to use applications that make it fast and easy for prospective customers to configure, design and visualize a space. About Youtuber Augmented Reality Solution, Demos, and Unity3d tutorials Channel. About Youtuber 8i’s mission is to enable the evolution of media and human communication by giving people the best way to connect with each other and express themselves through holograms. We provide the easiest way to create, mix and experience 3D human holograms that look real, and can be viewed from any angle, on any device for virtual, augmented or mixed reality. About Youtuber StypeGRIP provides camera tracking hardware, software and integration for real-time augmented reality and virtual studio broadcasting. Our flagship product, the Stype kit (system for tracking the camera position in 3D space), is currently being used by industry’s leading edge broadcasters such as Fox Sports Australia, the BBC, Star Sports India, Viasat Sport and many others. About Youtuber HoloLamp is the world’s first portable device to deliver a glasses-free and hands-free augmented reality experience. About Youtuber Augmented Reality, Virtual Reality development startup. ARLOOPA makes magic happen with Augmented Reality. It is an augmented reality (AR) app that allows you to unlock content built into physical world around you. About Youtuber AR&Co, The Asia’s Largest Augmented Reality & Innovative Technology based Company. About Youtuber Denys Gamers - Learn Basic Augmented Reality & Virtual Reality For Mobile Apps With More Basic Unity Tutorial. About Youtuber Catchoom offers "Visual Shopping"​ solutions (Image Recognition, mobile Augmented Reality and Fashion eCommerce-specific Artificial Intelligence) to help people make faster and better decisions via unique retail, product & marketing experiences. About Youtuber Augmented Vision Department Of The German Research Center for Artificial Intelligence (DFKI). The research department, Augmented Vision" develops innovative solutions in the fields of: Computer Vision, mainly 3D scene reconstruction (structure and motion estimation), real-time camera pose/motion estimation, object recognition and tracking in videos. About Youtuber Augmented Reality (AR) has come a long way since its inceptions in the early nineties. According to Milgram and Kishino(1994), AR can be defined as any case in which an otherwise real environment is “augmented” by means of virtual objects. About Youtuber Keep up with latest videos from Pirates Just AR. About Youtuber Seek adventure in your neighborhood, in the mountains, and to local businesses and be rewarded every time you open a Seek Chest! Jump into the phenomenon right now and start Seeking today. About Youtuber We started working in the AR field in 2000 with the development of virtual advertisements for live TV broadcasts. In the following years we expanded our expertise to applications in games, entertainment, media and marketing. Our current research focuses on applying AR/MR to architecture, construction and industrial applications. About Youtuber Keep up with latest videos from Augmented Climbing. About Youtuber ideos related to the Augmented Reality Group of Prof. Gudrun J. Klinker, Ph.D. at the Technische Universität München (TUM). About Youtuber Andrew Nakas offers Prototyping and experimenting in VR/AR. About Youtuber Welcome! This is where you can see examples of projects that we have going on - or things we are "experimenting" with in the world of Augmented Reality. About Youtuber RE’FLEKT is a Munich based technology company that enables any business or industry to create their own in-house Augmented and Virtual Reality applications. About Youtuber Keep up with latest videos from Genesis Augmented. About Youtuber Keep up with latest videos from Augmented World. About Youtuber Welcome to the Augmented Reality for Enterprise Alliance (AREA) YouTube channel. The AREA is the only global non-profit, member-based organization dedicated to widespread adoption of interoperable Augmented Reality-enabled enterprise systems. About Youtuber Augmented reality for modern touchscreen devices such as tablets and smartphones; running Android or iOS operating systems. About Youtuber Humai stands for Human Machine Integration, which is exactly what we do: we are developing solutions that combine the strength of people and technology. Whether it is Augmented Reality or Object Recognition, our standardised Cloud Platform or completely bespoke solutions, we always strive to optimize processes and reduce down time. About Youtuber We are a team of developers and Designers specialized in creating Augmented Reality App and 3D design. Thanks for checking out our video. 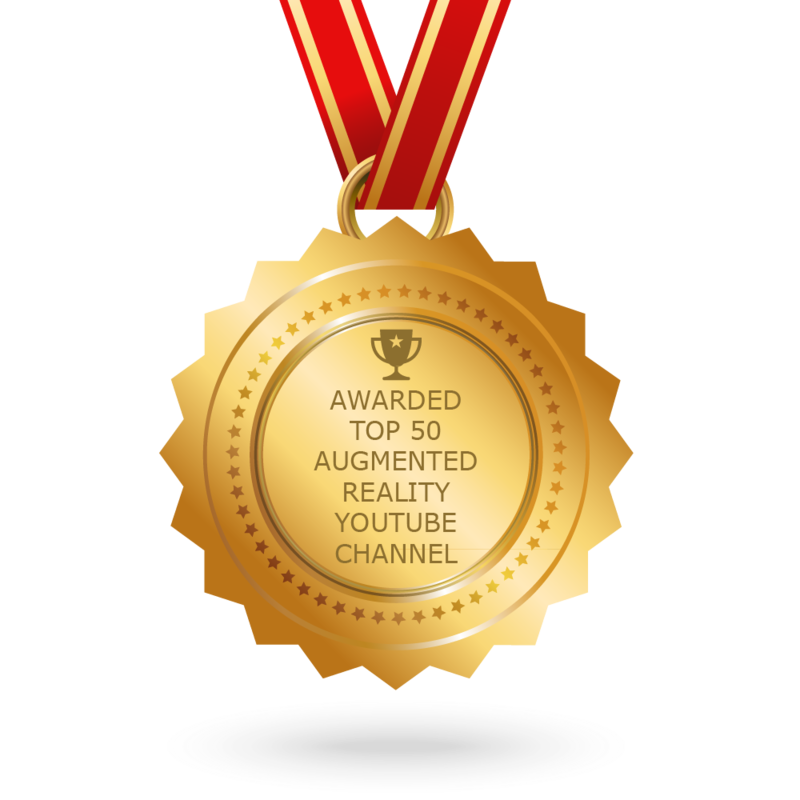 CONGRATULATIONS to every youtuber that has made this Top Augmented Reality Youtube Channels list! This is the most comprehensive list of best Augmented Reality Youtube Channels on the internet and I’m honoured to have you as part of this! I personally give you a high-five and want to thank you for your contribution to this world.